La Petite Longère is the apartment option we offer exclusively to couples wishing to book a single storey one bedroomed version of our character long-house. This provides spacious living accommodation and comprehensively equipped kitchen, alongside a ground floor double bedroom and shower room. if you would prefer to use the two upstairs bedrooms and shower rooms, please refer to the gîte details for La Vieille Longere). The holiday rental accommodation is entered through a traditional Breton arched doorway which opens into the double height hall featuring original exposed oak beams we have restored throughout the property. Outside the rear patio area has a built-in BBQ, outdoor dining furniture and a couple of zero gravity sun loungers. The uninterrupted rural views from here are magnificent all year round. Raised planters, herbs and fruit bushes edge the terrace; beyond which is our open paddock dotted with oak and cider apple trees. Inside the gîte, to the left of the hall there is an open plan galley kitchen which has a large cooker with five ring hob, fridge-freezer, dishwasher and lots of equipment for self-catering. The window seat is ideal for keeping an eye on dinner whilst enjoying a drink! Opposite the kitchen there is a spacious dual aspect living room with french doors opening onto the terrace. There is a dining table with four chairs, two large sofas and an efficient wood burner. Flat-screen TV receiving UK free-to-air channels, DVD player, a selection of books are provided. At the back of the house there is a pretty double bedroom which also has french doors to the terrace It has plenty of drawer and hanging space, a mirror, bedside tables and lamps, an easy chair and a radiator. The adjacent shower room has a shower cubicle, wc, basin with mirror, light and power above, towel radiator, cupboard and hair dryer. 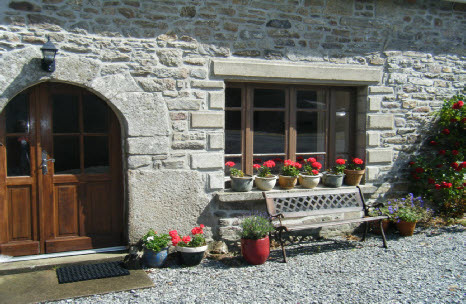 Our home in Brittany is next door to the longère gite, there are separate entrances and outdoor spaces. We are on-hand to answer questions if required but we do not intrude on our guests.